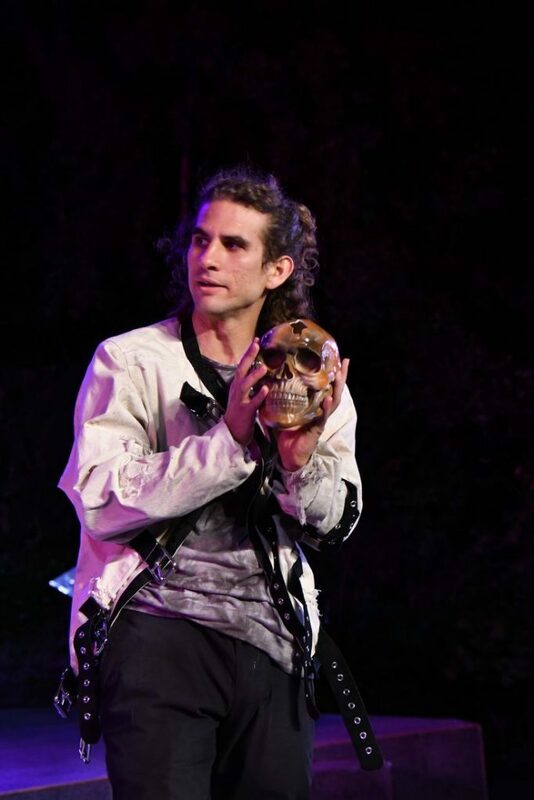 The most underrated production in the Bay Area right now is Marin Shakespeare Company’s Hamlet, which is brilliant in its deceptive simplicity. It is not that the production has been received with any hostility. It opened in late May to respectful, if lukewarm, reviews. But, I think it is much better that it has been given credit for being. In fact, it speaks with a powerfully current voice, and it is a production that one should not miss. Nate Currier in the title role. All photos by Jay Yamada. The reasons why it has not been fully appreciated are clear enough. The house style of this company is not flashy, not spectacle-oriented, and almost allergic to conceptual trendiness. 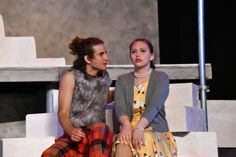 The focus is firmly on the performances (which can admittedly vary in sophistication due the youth and inexperience of the typical supporting cast) and on letting the text speak for itself. What emerges from this mix in this particular case is a production with the energy of a Rorschach inkblot. It is mostly neutral with just enough detail to evoke in the viewer a powerful, and personal, response. Marin Shakes is an intensely family affair. Artistic Director Robert S. Currier helmed this production, which was produced by his wife, Lesley Schisgall Currier, with a set design by his son, Jackson Currier, and stars his other son, Nate Currier, in the title role. Currier’s production is a modern dress production (costume designs by Tammy Berlin), but far from the high-concept intensity of, say, Robert Icke’s production starring Andrew Scott that electrified London a year ago. With the exception of Hamlet, himself, the costumes are mostly neutral – a nod to the Elizabethan manner of producing the plays in the dress of the time. Nate Currier’s initial costume (spoiler alert coming) is more provocative. In his first man-bunned appearance, he is wearing the black trenchcoat, boots, and attitude of a disaffected youth you vaguely worry about being a potential school shooter. He looks like he could have walked in from any suburban junior college. The fact that he seamlessly blended into the opening night audience and sat among us until he rose to spit out his defiant first line made this all the clearer. Before we saw (or at least knew we were seeing) Hamlet, however, we were treated to machine gun-carrying guards on the ramparts and a heavily-guarded court scene. The most modern thing about the production is that guns are everywhere. In this case, in a wonderful coup-de-theatre, Polonius delivered the advice straight but finished by casually handing his son a pistol. This striking moment, simple as it was, said everything needed about living in a time where the privileged are oppressors who somehow imagine themselves to be so disempowered that they must be armed at all times. The “advice” turned out to be window-dressing for appearing cultured while, in reality, retreating into ugly tribalism. Guns are the only thing that make anyone feel safe. Something is wrong in this Denmark, and it is not just with Claudius. This is the most disaffected Hamlet I have ever seen, and the dysfunction is everywhere. Seconds before intermission, after an affecting soliloquy, Horatio enters and casually hands Hamlet a paper bag, from which he withdraws a handgun of his own. Everyone’s solution to everything is the uniquely American threat of violence. Hamlet (Nate Currier) and Horatio (Brennan Pickman-Thoon) on Jackson Currier’s intentionally clean and generic set. This had interesting implications as Hamlet crept up on the praying Claudius and contemplated killing him. With a gun, rather than a sword, he was able to climb to some height on the set and stay far away from Claudius, yet still seem on the verge of murder. It was a simple solution, but rendered the moment the most realistically frightening I have ever seen it. Even in the final scene, which must be (and was) about a fencing match, there was a stunning moment when Laertes removed his jacket only to reveal that he had a concealed carry underneath it. The fact that no one inside the play seemed to think any of this was the least bit odd made it more, not less, chilling. The production is chocked full with effective choices, not always about guns. For example, Hamlet delivers one of his great soliloquies (“How all occasions do inform against me”) in a straightjacket as he is being shipped off to England for killing Polonius. Throughout the production a recurrent prop is the production program, popping up at wonderfully meta-theatrical times, such as the moment that Hamlet asks his mother (played by Arwen Anderson) to look on a picture of his father. Hamlet (Nate Currier) confronting Gertrude (Arwen Anderson) with the production program. Talia Friedenberg is an especially effective Ophelia, rendering the character with theatrical force rather than realistic (but out-of-place-in-verse-drama) histrionics. 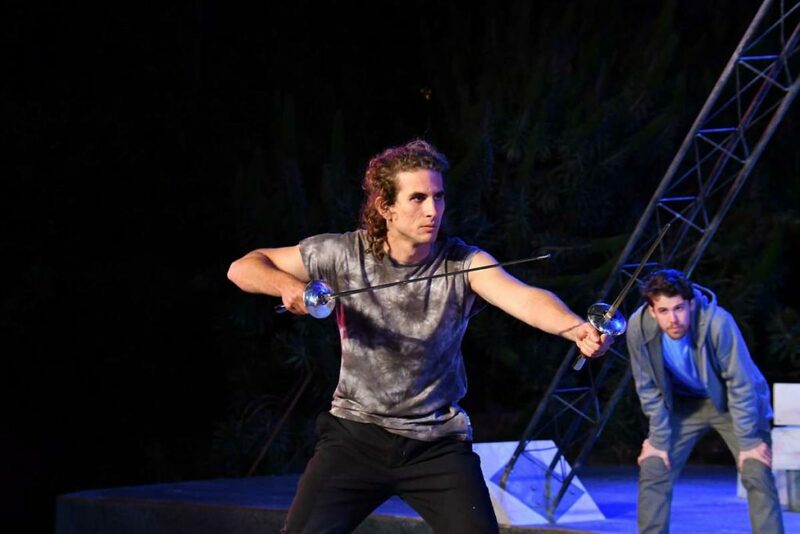 Her relationship to Laertes (Hunter Scott McNair, who also doubles terrifically as one of the visiting players) is clearer than I think I have ever seen it, as it is exceedingly complex from the moment she witnesses his accepting his father’s gun. Too much of the discussion about this production is interested in the family dynamics of the father-son, director-star team. Nate Currier is a very good Hamlet, but given the number of really good Hamlets that the Bay Area has seen in the last two seasons (John Douglas Thompson at ACT, William J. 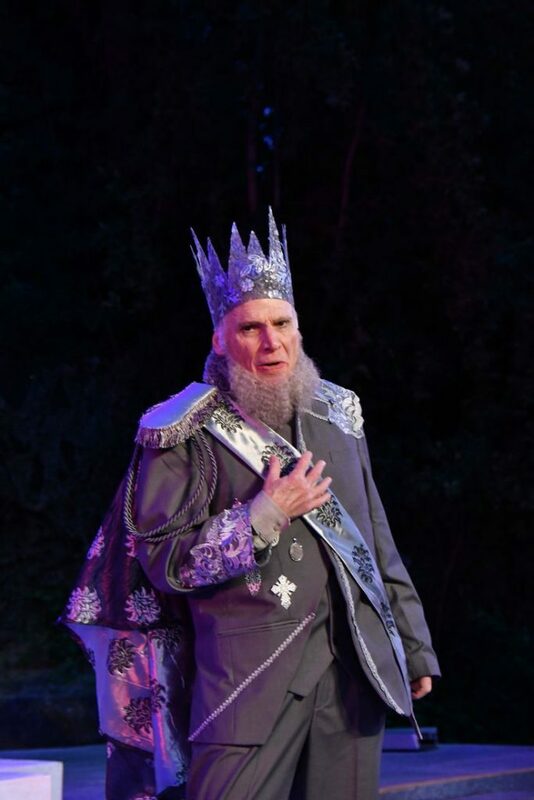 Brown at the Arabian Shakespeare Festival, Nathaniel Andalis at the San Francisco Shakespeare Festival, Kate Eastwood Norris at the Santa Cruz Shakespeare Festival, and a full cast of rotating Hamlets at Shotgun Players) this is not enough to occupy our attention. The real reason to see this production is because Robert Currier’s direction has never been better, and because you leave understanding exactly why Shakespeare’s tragedy is timeless. Go. It plays two more weekends! PS: This review was slow in posting for a simple, personal reason. This play, so laden with father-son images and discussions of death, was the first play I saw after the death of my own father in early May. It took me a while to face writing about it. What tragedy means in such an overwhelming circumstance is the subject of an upcoming post. Performances (in repertory) at 8 pm Thursdays, Fridays, Saturdays and Sundays; and 4 pm Sundays. See website (www.marinshakespeare.org) for specific repertory performance schedule. This review makes me want to hop a plane to see the production for its directing. No gimmicks (except maybe the Ghost’s voice), no mucking about with the text, but drilling down into its guts. The gun trope is terrifying (maybe a bit of shtick, but it sounds like it works in this production’s context.) I’ve written about the RSC’s first pared-down Hamlet in 1975, directed by the late Buzz Goodbody (Ben Kingsley as Hamlet). All about text and acting, with simple, stark images that stab the audience’s brain. 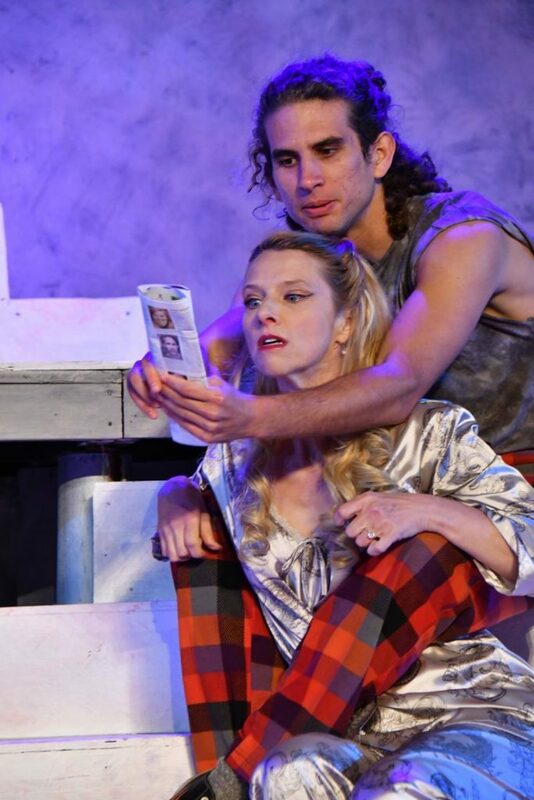 You are currently reading Rorschach HAMLET: A Review of Marin Shakespeare Company at Shakespeare's Tribe.